Tunis is the transcription of the Arabic name تونس which can be pronounced as "Tūnus", "Tūna or delata", or "Tūnis". All three variations were mentioned by the Greek-Syrian geographer al-Rumi Yaqout in his Mu'jam al-Bûldan (Dictionary of Countries). The historical study of Carthage is problematic. Because its culture and records were destroyed by the Romans at the end of the Third Punic War, very few Carthaginian primary historical sources survive. While there are a few ancient translations of Punic texts into Greek and Latin, as well as inscriptions on monuments and buildings discovered in Northwest Africa, the main sources are Greek and Roman historians, including Livy, Polybius, Appian, Cornelius Nepos, Silius Italicus, Plutarch, Dio Cassius, and Herodotus. These writers belonged to peoples in competition, and often in conflict, with Carthage. Greek cities contended with Carthage over Sicily, and the Romans fought three wars against Carthage. Not surprisingly, their accounts of Carthage are extremely hostile; while there are a few Greek authors who took a favourable view, these works have been lost. Tunis was originally a Berber settlement. The existence of the town is attested by sources dating from the 4th century BC. Situated on a hill, Tunis served as an excellent point from which the comings and goings of naval and caravan traffic to and from Carthage could be observed. Tunis was one of the first towns in the region to fall under Carthaginian control, and in the centuries that followed Tunis was mentioned in the military histories associated with Carthage. Thus, during Agathocles' expedition, which landed at Cape Bon in 310 BC, Tunis changed hands on various occasions. During the Mercenary War, it is possible that Tunis served as a center for the native population of the area, and that its population was mainly composed of peasants, fishermen, and craftsmen. Compared to the ancient ruins of Carthage, the ruins of ancient Tunis are not as large. According to Strabo, it was destroyed by the Romans in 146 BC during the Third Punic War. Both Tunis and Carthage were destroyed; Tunis, however, was rebuilt first under the rule of Augustus and became an important town under Roman control and the center of a booming agricultural industry. The city is mentioned in the Tabula Peutingeriana as Thuni. In the system of Roman roads for the Roman province of Africa, Tunis had the title of mutatio ("way station, resting place"). Tunis, increasingly Romanized, was also eventually Christianized and became the seat of a bishop. However, Tunis remained modestly sized compared to Carthage during this time. The modern city of Tunis was settled by Arab Muslim troops, around the 7th century AD. The medina of Tunis, the oldest section of the city, dates from this period, during which the region was conquered by the Umayyad emir Hasan ibn al-Nu'man al-Ghasani. The city had the natural advantage of coastal access, via the Mediterranean, to the major ports of southern Europe. Early on, Tunis played a military role; the Arabs recognized the strategic importance of its proximity to the Strait of Sicily. From the beginning of the 8th century Tunis was the chef-lieu of the area: it became the Arabs' naval base in the western Mediterranean Sea, and took on considerable military importance. Under the Aghlabids, the people of Tunis revolted numerous times, but the city benefited from economic improvements and quickly became the second most important in the kingdom. It was briefly the national capital, from the end of the reign of Ibrahim II in 902, until 909 when control over Ifriqiya was lost to the newly founded Fatimid Caliphate. 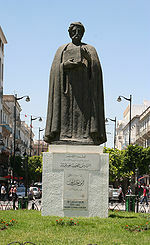 During this period, one of the famous travellers to Tunis was Ibn Battuta. In his travel account, when Ibn Battuta and his group arrived in Tunis, the population of the city came out to meet him and the other the members of his party. They all greeted them and were very curious, many were asking questions, however, no one in Tunis personally greeted Ibn Battuta, greatly upsetting him. He felt very lonely and could not hold back the tears coming from his eyes. This went on for a while until one of the pilgrims realized he was upset, he went up and greeted and talked to Ibn until he entered the city. At the time, the Sultan of Tunis was Abu Yahya and during Ibn Battuta’s stay, the Festival of the Breaking of the Fast was taking place. The people in the city assembled in large numbers to celebrate the festival, in extravagant and most luxurious outfits. Abu Yahya arrived on horseback, where all of his relatives joined him. After the performance, the people returned to their homes. The Ottoman Empire took nominal control of Tunis in 1534 when Hayreddin Barbarossa captured it from the Hafsid Sultan Mulai Hassan, who fled to the court of Charles V, Holy Roman Emperor and King of Spain. Charles, suffering losses from the corsairs operating out of Djerba, Tunis, and Algiers, agreed to reinstate Mulai Hassan in exchange for his acceptance of Spanish suzerainty. A naval expedition led by Charles himself was dispatched in 1535, and the city was recaptured. The victory against the corsairs is recorded in a tapestry at the Royal Palace of Madrid. The Spanish governor of La Goulette, Luys Peres Varga, fortified the island of Chikly in the lake of Tunis to strengthen the city's defences between 1546 and 1550. The Ottoman Uluç Ali Reis, at the head of an army of janissaries and Kabyles, retook Tunis in 1569. However, following the Battle of Lepanto in 1571, the Spanish under John of Austria succeeded in retaking the city and re-establishing the Hafsid sovereign in October 1573. Following these conflicts, the city finally fell into Ottoman hands in August 1574. Having become an Ottoman province governed by a Pasha who was appointed by the Sultan based in Constantinople, the country attained a degree of autonomy. After 1591, the Ottoman governors (Beys) were relatively independent, and both piracy and trade continued to flourish. Under the rule of deys and Moorish beys, the capital sprang into new life. Its population grew by additions from various ethnicities, among which were Moorish refugees from Spain, and economic activities diversified. To traditional industry and trade with distant lands was added the activity of the Barbary pirates, then in their golden age. Profits obtained from the trade in Christian slaves allowed the rulers to build sumptuous structures that revived the architectural heritage of the Middle Ages. At the beginning of the 18th century, Tunisia entered into a new period in its history with the advent of the Husainid dynasty. Successive Husainid rulers made great progress in developing the city and its buildings. During this period, the city prospered as a centre of commerce. Taking advantage of divisions within the ruling house, Algerians captured Tunis in 1756 and put the country under supervision. Hammouda Bey faced bombardment by the Venetian fleet, and the city experienced a rebellion in 1811. Under the reign of Hussein Bey II, naval defeats by the British (1826) and French (1827) saw the French become increasingly active in the city and in the economy. During World War II, Tunis was held by Axis forces from November 1942 to May 1943. 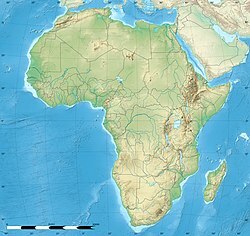 It was their last base in Africa, as they retreated towards Sicily after being surrounded by Allied forces from Algeria to the west and from Libya to the east. On 7 May 1943, at about 15:30 in the afternoon, Tunis fell to troops of British 1st Army and the U.S. 1st Army, which had defeated the German 5th Panzer Army guarding the city. At midday on 20 May 1943, the Allies held a victory parade on Avenue Maréchal Galliéni, and Avenue Jules Ferry, to signal the end of fighting in North Africa. Having succeeded in driving the Axis powers out of Tunisia, the Allies used Tunis as a base of operations from which to stage amphibious assaults first against the island of Pantelleria, and then Sicily, and finally the mainland of Italy. Tunis is located in north-eastern Tunisia on the Lake of Tunis, and is connected to the Mediterranean sea's Gulf of Tunis by a canal which terminates at the port of La Goulette/Halq al Wadi. The ancient city of Carthage is located just north of Tunis along the coastal part. The city lies on a similar latitude as the southernmost points of Europe. The city of Tunis is built on a hill slope down to the lake of Tunis. These hills contain places such as Notre-Dame de Tunis, Ras Tabia, La Rabta, La Kasbah, Montfleury and La Manoubia with altitudes just above 50 metres (160 feet). The city is located at the crossroads of a narrow strip of land between Lake Tunis and Séjoumi. The isthmus between them is what geologists call the "Tunis dome", which includes hills of limestone and sediments. It forms a natural bridge and since ancient times several major roads linking to Egypt and elsewhere in Tunisia have branched out from it. The roads also connect with Carthage, emphasising its political and economic importance not only in Tunisia but more widely in North Africa and the Mediterranean Sea in ancient times. Winter is the wettest season of the year, when more than a third of the annual rainfall falls during this period, raining on average every two or three days. The sun may still increase the temperature from 7 °C (45 °F) in the morning to 16 °C (61 °F) in the afternoon on average during the winter. Frosts are rare. In spring, rainfall declines by half. The sunshine becomes dominant in May when it reaches 10 hours a day on average. In March temperatures may vary between 8 °C (46 °F) and 18 °C (64 °F), and between 13 °C (55 °F) and 24 °C (75 °F) in May. However, it is common for temperatures to soar even as early as April with record temperatures reaching 40 °C (104 °F). In summer, rain is almost completely absent and the sunlight is at a maximum. The average temperatures in the summer months of June, July, August, and September are very high. Sea breezes may mitigate the heat, but sometimes the sirocco winds reverse the trend. In autumn, it begins to rain, often with short thunderstorms, which can sometimes cause flash floods or even flood some parts of the city. The month of November marks a break in the general heat with average temperatures ranging from 11 °C (52 °F) to 20 °C (68 °F). Souad Abderrahim, mayor of Tunis since 2018. Following the municipal elections of 6 May 2018, Ennahdha obtained 21 seats out of 60. Nidaa Tounes came second with 17 seats. On 3 July 2018, the head of the Ennahdha list Souad Abderrahim was elected by the council as the new mayor of the capital. Before 2011, unlike other mayors in Tunisia, the mayor of Tunis is appointed by decree of the President of the Republic from among the members of the City Council. Map of the arrondissements of Tunis - 1, Médina; 2, Sidi El Béchir; 3, Sijoumi; 4, Bab Souika; 5, El Omrane; 6, Bab Bhar; 7, El Menzah; 8, El Omrane Supérieur; 9, Ettahrir; 10, Bardo; 11, Ezzouhour; 12, El Ourdia; 13, Jebel Jelloud; 14, Kabaria; 15, Cité El Khadra; 16, El Bouhaira; 17, La Marsa; 18, Carthage; 19, La Goulette; 20, Hrairia; 21, Sidi Hassine. At the beginning of the 21st century, the city of Tunis exceeds 2,000,000 inhabitants. After independence, the Tunisian government implemented a plan to cope with population growth of the city and country, a system of family planning, to attempt to lower the rate of population growth. However, between 1994 and 2004, the population of the governorate of Tunis grew more than 1.03% per annum. It represents, in the 2004 census, 9.9% of the total population of Tunisia. As in the rest of Tunisia, literacy in the region of Tunis evolved rapidly during the second half of the 20th century and has reached a level slightly higher than the national average. The education level is only exceeded by the neighbouring governorate of Ariana which has many institutions of education. Because of the concentration of political authority (headquarters of the central government, presidency, parliament, ministries and central government) and culture (festivals and mainstream media), Tunis is the only nationally ranking metropolis. Tunis is the heartland of the Tunisian economy and is the industrial and economic hub of the country, home to one third of Tunisian companies—including almost all the head offices of companies with more than fifty employees, with the exception of the Compagnie des Phosphates de Gafsa, headquartered in Gafsa—and produces a third of the national gross domestic product. Tunis attracts foreign investors (33% of companies, 26% of investments and 27% of employment), excluding several areas due to economic imbalances. According to the Mercer 2017 Cost of Living Rankings, Tunis has the lowest cost of living for expatriates in the world. The urban unemployment rate of university graduates is increasing and the illiteracy rate remains high among the elderly (27% of women and 12% of men). The number of people living below the poverty line, falling at the national level, remains higher in urban areas. In addition, unemployment is high in young people aged 18 to 24, with one in three unemployed as compared to one in six at the national level. In Greater Tunis, the proportion of young unemployed is at 35%. Primary industry such as agriculture, however, is active in specialized agricultural areas on the suburbs, particularly in the wine and olive oil industries. The generally flat terrain and the two main rivers in Tunisia, the Medjerda to the north and the Milian to the south, the soils are fertile. Tunis has several large plains, the most productive are in Ariana and La Soukra (north), the plain of Manouba (west) and the plain of Mornag (south). In addition, groundwater is easily accessible through the drilling of deep wells, providing water for the different agriculture crops. The soils are heavy and contain limestone in the north but are lighter and sandy containing clay in the south. There is much diversification in the municipality of Tunis, with Durum grown in Manouba, Olives and olive oil in Ariana and Mornag, wine (Mornag), and fruit, vegetable and legumes are grown in all regions. Court of Dar Soulaimania, once the boarding lodge of University of Ez-Zitouna. Greeks used to enjoy an important presence in the city since ancient times. Tunis is the headquarters of the Greek Orthodox Holy Archdiocese of Carthage with jurisdiction over Algeria, Mauritania, Morocco, and Tunisia. It belongs to the Patriarchate of Alexandria and All Africa and its Cathedral, small school and other buildings are in Central Tunis. In total, there are three Greek Orthodox and two Russian Orthodox parishes in Tunisia. The Coptic Orthodox Church of Alexandria also maintains jurisdiction in Tunisia. The small Orthodox community is centred around the Greek Orthodox Church (1862), managed by the Greek Embassy and the Russian Orthodox Church (1957), reflecting the presence in Tunisia of a small colony of Russian immigrants. Tunis and its suburbs have many of the major Tunisian universities including the University of Tunis, Tunisia Private University, University of Ez-Zitouna, the University of Tunis – El Manar, the University of Carthage and the Manouba University. It therefore has the highest concentration of students in Tunisia, with a student population of 75,597 as of 2006[update]. Tunis has some of the most important libraries in Tunisia including the National Library of Tunisia which was first installed in 1924 in the Medina, in a building built in 1810 by Hammouda Bey to serve as barracks for troops and then a jail. The library moved to its current location on Boulevard 9 April in 1938. The new building contains a reading room, conference room, laboratories, an exhibition gallery, a block of technical and administrative services, a restaurant, a parking and green space areas. ^ Room, Adrian (2006). Placenames of the World: Origins and Meanings of the Names for 6,600 Countries, Cities, Territories, Natural Features, and Historic Sites. McFarland. p. 385. ISBN 0-7864-2248-3. ^ Jongeling, K. (2005). "The Neo-Punic Inscriptions and Coin Legends". University of Leiden. Archived from the original on June 29, 2006. Retrieved April 14, 2006. ^ a b "Carthage – 1960, Page 11 by B. H. Warmington. – Online Research Library: Questia". questia.com. ^ Allen James Fromherz (16 March 2016). Near West: Medieval North Africa, Latin Europe and the Mediterranean in the Second Axial Age. Edinburgh University Press. p. 87. ISBN 978-1-4744-1007-6. ^ Labadi, Sophia; Logan, William (2015). Urban Heritage, Development and Sustainability: International Frameworks, National and Local Governance. Routledge. p. 59. ^ Morsy, Magali (1984). North Africa, 1800–1900: a survey from the Nile Valley to the Atlantic. Longman. p. 185. ISBN 0-582-78377-1. Mustafa Khaznadar became Prime Minister in 1837, a position he maintained under three successive beys, more or less continuously until 1873. ^ "Gunmen storm Tunisian museum, kill 17 foreign tourists". 18 March 2017 – via Reuters. ^ "19 killed in Tunisia attack; hostage drama ends with deaths of gunmen". aljazeera.com. ^ "Tunis-Carthage Climate Normals 1961–1990". National Oceanic and Atmospheric Administration. Retrieved 18 December 2018. ^ "Station Tunis" (in French). Météo Climat. Retrieved 18 December 2018. ^ (in French) Arrondissements municipaux (Municipalité de Tunis). ^ a b c d (in French) Stratégie de développement de la ville de Tunis (Municipalité de Tunis). ^ a b (in French) Fiche de présentation de la médina (Association de sauvegarde de la médina de Tunis) Archived 2008-12-23 at the Wayback Machine. ^ (in French) Entretien avec Jamila Binous sur la médina de Tunis (TV5) Archived 2008-04-17 at the Wayback Machine. ^ Cette dernière est construite sur ordre du souverain Romdhane Bey en 1696 pour y inhumer la dépouille de sa mère d'origine italienne et de culte protestant. Elle est gérée par l'ambassade du Royaume-Uni à Tunis. ^ Miller, Duane (2016). "Contextuality, Contextualization, and the New Christians of Tunis". Pharos Journal of Theology. 97: 1–13. Retrieved 16 April 2016. ^ Zouari, Kenza (3 December 2014). "The Cultural Importance Of The Tunisian Carthage Film Festival". Film Inquiry. Film Inquiry Society. Retrieved 28 August 2017. ^ "The Carthage Film Festival celebrates its 50th birthday". Air France. Air France. 7 May 2016. Retrieved 28 August 2017. ^ "e-Market place |". Snt.com.tn. 2012-11-13. Archived from the original on 2002-04-02. Retrieved 2013-03-12. ^ (in French) Chokri Ben Nessir, « Une véritable requalification routière », La Presse de Tunisie. ^ "أخبار تونس: آخر الأخبار الوطنية والجهوية على راديو موزاييك". mosaiquefm.net. Turki, Sami Yassine; Zhioua, Imène Zaâfrane (2006). Analyse de la répartition spatiale et de l'aménagement des espaces verts programmés par les documents d'urbanisme dans le Grand Tunis (PDF). Actes du séminaire « Étapes de recherches en paysage » (in French). 8. Versailles: École nationale supérieure du paysage. Archived from the original (PDF) on 2006-11-24.